Roundtable tells senator about growing problem of gangs in N. Va. It wasn't just police who were warning Tim Kaine that hardened gang members have entered the United States and settled in the D.C. area. EDITOR’S NOTE: This story has been edited to remove the name of the student who participated in the forum. ALEXANDRIA, Va. — Investigating Northern Virginia’s gang problem, Sen. Tim Kaine, D-Va., got an earful about the dangers and growth of the Salvadoran-centric street gang MS-13, which has embedded itself throughout northern Virginia and suburban Maryland. “The fact is we’re getting kids from other countries who have killed people down there, who have committed murders, that are coming here and are recruiting. And they’re coming here with that one goal. The gangs are sending them here,” said Detective Ken Compher of the Fairfax County Police Department’s gang unit. In the Kaine-led roundtable discussion on gang activity, it wasn’t just police who were warning that hardened gang members have entered the U.S. and settled in the area. With Alexandria City Mayor Allison Silberberg looking on, one student formerly associated with gang activity warned of the dangers in his neighborhood of Chirilagua, where he suggested that MS-13 gang members hold sway. Children 6, 7 and 8 years old are being lured into gangs, and that some are following their parents, the student said. Police officers at the roundtable expressed the belief that government policy has made matters worse. “The problem that we’ve had — at least on the local level — is nobody shares the information with us. … I know how many undocumented children Fairfax County has received since 2013, but I couldn’t tell you who any of them are, because none of that information is ever shared with Fairfax County,” Compher said. Kaine dealt firsthand with gang issues as the former mayor of Richmond. “Issues of gang violence are very important. I want to make sure that we’re making the right investments, and not just dollar amounts but the dollars we’re spending, we’re spending in the right way,” Kaine said. The experts say kids, sometimes new immigrants, are lured to gangs to help themselves fit in. New immigrants go to the first person who shows them love or shows them friendship, warning that young immigrants with a sense of alienation are prime targets for gangs, the student told the forum. Alexandria may pride itself as an “inclusive” city, but the student paints a different picture about the city’s only public high school, saying each floor is divided by race. Kaine recounted how he was asked if the gang problem is getting better or worse. “And I said, ‘Well, that’s one of the reasons why I’m here — to learn,’” Kaine said. “What I will say: I don’t think we’re happy with the progress we’re making. 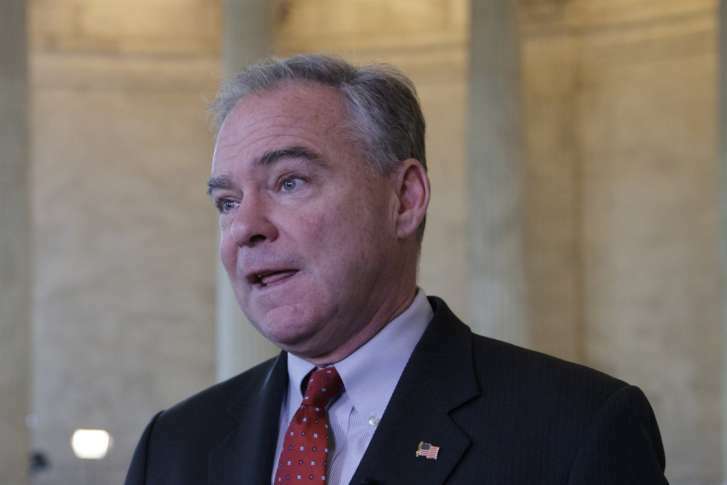 Whether it’s getting better or whether it’s getting worse, I think we need to be making more progress,” Kaine said.